The refurbishment of The Hideout pub and restaurant will be featured on the 'At Your Service' RTE TV series on Sunday 20 May, writes Brian Byrne. 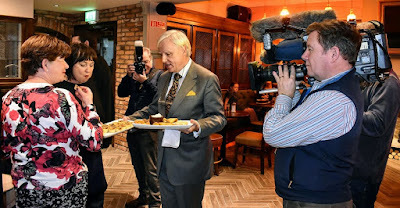 Filmed during the renovation works carried out through last year, the programme features Francis Brennan and his brother John from the Park Hotel in Kenmare as they follow progress and advise Jonathan Keogh on the direction to take with his vision of the famous Kilcullen landmark. It is the tenth series of the programme, first aired in 2008. Since then the Brennan brothers have participated in makeovers of hotels, pubs, restaurants, B&Bs, golf clubs, hostels and tourism-related enterprises the length and breadth of the country. In addition to the inside story on the ups and downs of the work to bring The Hideout to the place it is today, Kilcullen viewers will get see many familiar local faces at the 'wrap' party, filmed in December. Some will even be seeing themselves on TV for the first time. A date for your viewing diary.